The Etiquette of Resigning - Finesse Worldwide, Inc.
“I QUIT!” Might be what you want to yell from the rooftops, or angerly shout at your boss, but while it might feel great at the moment, it is NOT what will help you in the long run. Get a letter of recommendation from your boss or anyone at the office. Leave with dignity and class. Have people fondly remember you. Ever go back to work for that company (or with someone who left that company and is now hiring for a job you want). Write a letter of resignation and give it directly to your manager, boss or HR Department. The best way to do this is to ask to meet with your boss in private (not with others around), sit down and tell him/her the situation, and then hand your boss the letter so they have it in writing. 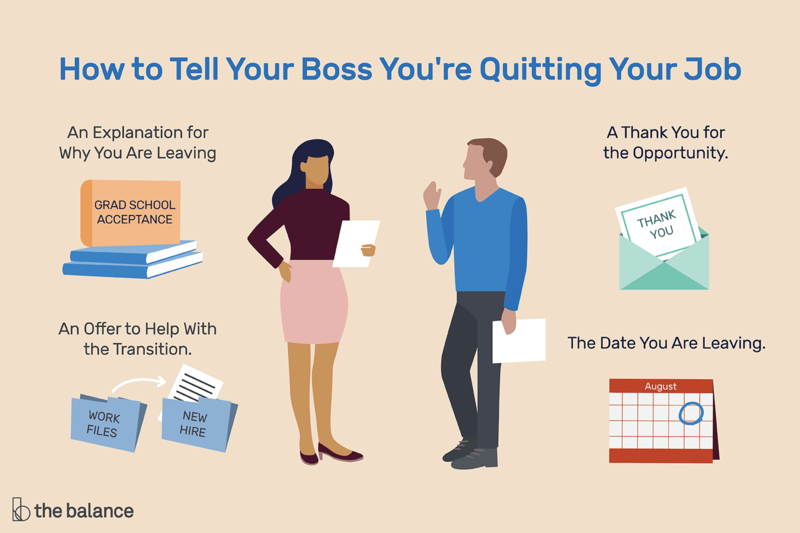 Refer to the tips below of how to tell your boss you’re resigning. Clean up your computer, desk, and office. Even if you give notice, your employer may decide to immediately show you the door. Before you turn in your resignation, clean up your computer and delete personal files and email messages. Do keep all of your email and phone contacts in case you need them for networking. Give notice. The standard is to give two weeks’ notice so that your company can find a replacement, you can finish your work, and you can train others to take over your work. If for some reason this isn’t feasible (i.e., you’re sick, sexual harassment, family emergency) then explain why you can’t give notice to your boss so that he/she understands. Train someone else on your job. Ask for a Reference. Ask your boss and colleagues if they would be willing to give you a reference. If they agree, one of the best tools is to have them write you a recommendation on LinkedIn. This will become part of your profile which is very helpful in your job search. In addition, ask them if they would be okay with you using their name and contact information with potential employers to call for a verbal reference. Text or even leave a message or send an email about the resignation. The etiquette of resigning is that you owe your boss and your company the respect to tell the person directly if at all possible. If the circumstances are that you have to give two weeks notice and your boss is out of the country, out sick or they have done something to you where you might not feel comfortable talking to them in person (i.e., sexual harassment), then you can send an email or leave a voicemail message giving the information and stating that you have attached or will send your letter of resignation. It is never professional to text your boss that you quit. and an important etiquette of resigning tip. Complain. Even if you hate your job, your boss, or coworkers, no good will come from you talking about it with anyone now that you are leaving. You want your boss to still have good feelings about you and recommend you, and your fellow co-workers will be left in that environment and they don’t need to feel jealous that you’re getting out. Brag. Even if you got the “best job in the world”, don’t brag about it to people at your current job. Forget to say good-bye. If you haven’t been immediately escorted out of the office, then make sure you take the time to say good-bye to those people you have worked with. It’s a nice thing to do, but also may help you keep up the relationship, or at least the connection after you’re gone. You can even send a farewell email to everyone on your last day giving your new contact information and wishing them all well. When you’re resigning in person to your boss, manager or to the Human Resources department, below are etiquette of resigning tips to keep in mind. Give thanks. Thank them for the opportunity to have worked with them and the company. Offer to help with the transition. Make clear what you can do to help and ask them what they would like you to complete (if possible) before you leave. Give notice. Let them know the last date you can work and have that date in wiring in your official letter of resignation. If you can’t give two weeks notice then it would be beneficial to explain why to your employer. When quitting a job, try to remember these etiquette of resigning tips and remain positive, professional and posed. Others will think well of you and you will reap the benefits. For more etiquette tips, please go to my website, Finesse Worldwide, or email me directly at aimee@finesseworldwide.com.